Our family is very grateful that trials coming our way made us closer to each other and made our faith stronger in the Lord. Gina, one of my younger sisters, greatly comforted me when the doctor revealed to me my sickness. She’s a school teacher at Sum-ag, Bacolod City at present. Many years ago, she encountered a very severe trial. Her husband was run-over by an 18 wheeler truck resulting in his sudden death. She became a very young widow with 3 very young children. How did she cope with the tragedy? She stepped inside Job’s shoes. This is her testimony of God’s goodness, which also comforted and strengthened me. What does “stepping inside Job’s shoes” entail? Being aware that God has chosen you to be tested. Have you seen my servant Job? Test him. God is mighty proud of Job. If you are under severe trial, God is making you his showcase. Being aware that God is highly confident that like Job, we can surpass these tests. God is very sure of Job’s faith, that he will not waver while facing trials. Being aware that God is right there at Job’s side monitoring the whole thing. God didn’t abandon Job. Being aware that God did strengthen Job and greatly blessed and rewarded him after he has passed the test! These convictions strengthened Gina’s resolve to overcome her fiery trials. Our family is very grateful that trials coming our way made us closer to each other and made our faith stronger in the Lord. Good day everyone! ‘Daw kahapon lang’ (It seems like yesterday) we said goodbye to our family, relatives and friends in Iloilo, Philippines. On 10 November 2012, we reached one year of living in New Zealand. Moving and traveling to a new country and starting a new life is one faith journey that we will always remember. On the one hand were the hardships that went with the transition. It is always given and expected. On the other hand is God, His loving kindness, His Mighty hand, continuously guiding and showering us with goodness and grace. Traveling to a foreign country for the first time as a family is really exciting and enjoying. Exciting because you get to experience many “firsts” and you just enjoy laughing at all the “miscues”. Of course, it’s always good to ask when you’re in doubt. So, we were inside the old Manila International Airport. I was pushing our trolley full of baggage towards the Malaysian Airlines counter. I approached a Chinese-looking guy wearing Malaysian Airline uniform and spoke to him in my best English only to be responded to in Tagalog. He’s Filipino. What really gave us priceless and immeasurable joy was seeing our daughter enjoying the trip, cheering and smiling all along, unmindful of what lies ahead in our New Zealand sojourn. We left Manila on 9 November 2011. The three-hour flight from Manila to Kuala Lumpur was quite smooth and on time. Because our connecting flight was still three hours away, we hanged out at the KL International Airport. We also got to know other Filipinos bound for Auckland. Wi-Fi Internet at the airport enabled us to contact home and update our family. Finally we left Kuala Lumpur at almost 10:00 PM and with 11 hours flight, we slept and took much-needed rest. At Auckland Airport, Boyet and Sharon Quimba met us. They’ve lived in Auckland for six years. We are so grateful for Boyet and Sharon and their family for providing shelter and valuable guidance as we started our new life in New Zealand. We thank all our brothers and sisters in Christ who consistently pray for us. We thank our families and kin for your love and thoughtfulness. We thank the Lord God Almighty for the safe trip and most of all for making our New Zealand living possible and successful. I started working with Central Philippine University in 2005. After working for six years, I faced unemployment. I took the risk of quitting my job at 43-years-old for the cause of justice and dignity. I resolved to resign after experiencing harsh treatment of insults, intrigues, lies, and prejudices. These things manifested in many ways and the worst was when my wages were diminished. With the paltry sum I was getting every pay-day, I told my wife that it’s time to go and look for better opportunities. Prior to finally resigning on 31 March 2011, I filed a six-month leave without pay. Following my filing of case at National Labor Relations Commission on 1 October 2010, I submitted my application for a leave without pay for six months. I just wanted to avoid further persecution while my labor complaint was developing. How will I support my family for six months without salary was a matter that our Almighty God resolved. Creekside Baptist Church, a house church in Sambag, Jaro, Iloilo invited me as their interim pastor beginning October 2010. Their offer affirmed my pastoral calling and so I accepted willingly. On the day after I accepted the invitation, I received three invitations for online writing and search engine optimization projects through oDesk. What a blessing and affirmation of support. One of them was the “David” who knocked-out my worries of unemployment. He offered initially 30-hours a week of work, then adjusted it to 40-hours a week after I decided to work solely for him. Let me list how the God-sent “David” knocked out my unemployment “Goliath”. I am listing this to boast of God’s goodness and how literal and real He does things to those who believe in His mighty power. David assigned me to manage as many as 14 websites, ten of them are big car dealers in Canada. Indeed, what happened was proof that God sends His “David” to fight and defeat our “Goliath”. He never fails His promise of deliverance and He never runs out of noble deliverers. Today, 31 March 2012, marks the date when I terminated my work with CPU but I would rather think of it as an anniversary of my liberation from a leadership that wreaks of injustice, pride, and jealousy. I worked with David’s company for a year. Thank you dear God for sending us “David”. We will always remember your goodness as long as we live. 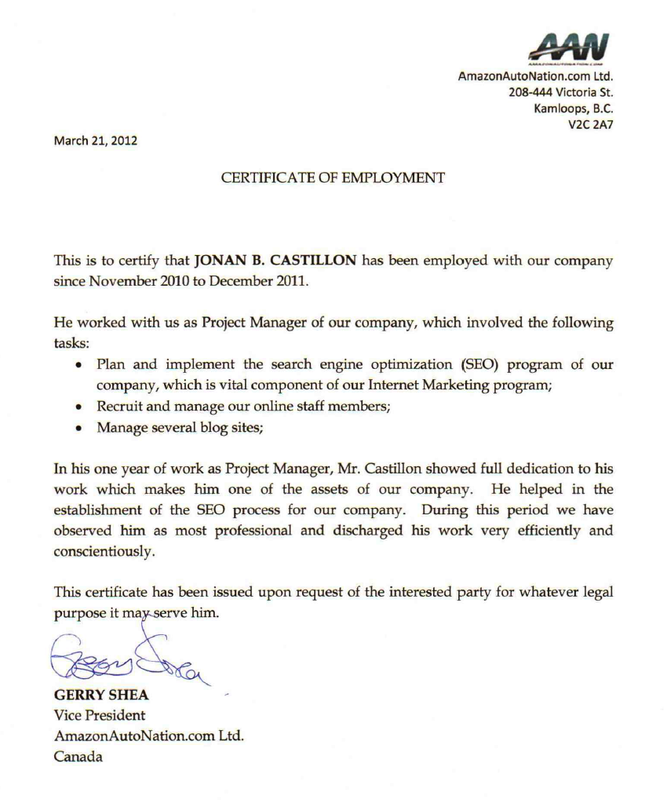 Later, his company issued a certificate of employment to credit my year-long service.